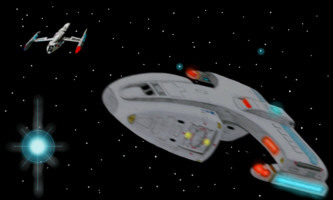 The USS Solaris slowed towards a full stop as she drew closer to Starbase 3. The base was a small standard station although still a vast man-made structure, a mushroom shaped centre of operations that was routinely assigned to non-tactical positions around Federation space. Trinok 2 was a green and blue planet, M class and very much like Earth which was one reason it had been colonised very early in Federation history and was now a centre of ship production that rivalled even the sprawling Utopia Planitia construction yards around Mars. 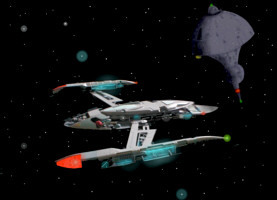 Trinok was the second planet orbiting a small sun and the inhabitants had little or no interest in Starfleet matters, they preferred to concern themselves with civilian transport vessels, freighters and light couriers at which they had excelled for nearly two centuries earning themselves a well deserved reputation for excellence. "So what do you think of this?" Captain Graves asked as he gazed out of the view port of the executive quarters he’d been assigned aboard the light Starfleet transport vessel. "It’s an impressive place." Commander Morrow agreed. "They’re known as the biggest non-Starfleet production plant in the known galaxy." "Have you been reviewing the files?" Captain Blake Girling called out as he turned away from the replicator with a cup of steaming coffee. "I’ve had a look through." The civilian Captain agreed with a measured note of sarcasm. "I think I know what sort of ship I’m looking for." "Just make sure your small crew can handle it." Captain Girling told him in a slightly patronising way. "We can have anything?" Commander Morrow asked with an enthusiastic grin. "I’m coming down to the surface with you." Blake told him as he sat down. "Captain Reader has arranged for us to acquire a ship with a full tactical grid. I’d recommend going for a scout or light transport ship retrofitted as a fast courier." "This place equips Starfleet?" Captain Graves shrugged, offering a slightly greater degree of his attention. "Why do they build ships with weapons here?" "Starfleet uses some commercial type ships." Blake shrugged back. "There are dozens of small armed ships in the yards for hazardous delivery missions." "And they’ll let me have any one I like?" Graves enthused excitedly, rubbing his hands together. "More or less." Blake nodded, his eyebrow raised as he wondered just how good an idea this really was. "You choose one and then I’ll get it assigned to you using the clearance from Reader." "I have some ideas." Commander Morrow added, holding up his Padd. "I’ve reviewed some files and narrowed the field down to half a dozen types that might work for us." "Great!" Blake grinned. "I’m going to get some shore leave time on the surface so I’ll be leaving you guys to it." "You can rely on us!" Graves told him. "I’m not assuming that!" Blake sighed. "The Corinthian is in orbit already but she’ll stay under cloak. I can imagine the interest she’d attract on a planet whose entire population is involved in ship design." "You really can rely on us!" Commander Morrow assured him. "I hope so." Blake smiled weakly, casting a suspicious eye on the wayward merchant Captain. "Are you beaming back to the Corinthian?" Graves asked. "Yes." Blake agreed. "Please remember not to mention her to anybody…"
Blake breathed out heavily as he initiated the Corinthians transporters and began to fade out in a shimmering blue light. "Thank god he’s gone." Captain Graves clapped his hands together happily. "Now we can get drunk!" "Welcome back." Haldo Compz looked up with disinterest from his work station at the bridge as Blake materialised. "Don’t you ever go to the engine room?" Girling replied sarcastically. "I’m hoping to get there tomorrow." Haldo complained. "I’ve nearly found a way to lower the defensive shields that keep appearing as I get near the doors." "Sorry about that!" Blake smiled insincerely. "Are you really going to let the comic duo obtain an armed ship on their own?" Haldo smirked. "You know that there’s so much that could go wrong?" "I know." Blake grumbled a strained reply. "We need a supply ship and there’s nobody else I’d trust." "Goruss Clogg is aboard." Haldo told him, not wishing to dwell too long on thoughts of what Captain Graves might do with a heavily armed scout ship. "Katherine is checking him out now." "Would that be Ensign Rogers?" Blake continued with a slight note of irritation. "Oh yeah!" Haldo grinned. "I keep forgetting about that chain of command thing." "I’d like to speak with him when he’s through with his medical." Blake said thoughtfully. "I want to make sure we’re all speaking the same language." "He’s a good man." Haldo shrugged. "And Reader said his record is spotless." "He might put this guys nose out of joint!" Doctor Jones interjected as he stepped to the front of the bridge to where the two nameless modified crewmen sat in cold and isolated silence at their stations. "One of these two is controlling the tactical systems." "I think we need to give these two names." Haldo added. "We can’t keep calling them Chip and Dale." "No we can’t!" Blake agreed firmly. "And I don’t want to hear anyone insulting them again." "They don’t mind!" Doctor Jones added as he balanced a Tricorder on the large mans head while he stared unswervingly forwards. "Stop that!" Blake snapped. "Show some respect." "Sorry." Jones apologised, stepping back awkwardly. "You have a message from Reader!" Haldo said, breaking the brief but awkward silence. "I do?" Blake spun around in some surprise. "It’s downloaded into a Padd for you in your office." Haldo explained. "It’s not in the computer system, it arrived when you were over at the Solara." "Right!" Blake mumbled as he hoisted himself out of the command chair. "I’ll be in my office." Captain Graves and Commander Reader stepped off of the Transporter pad in the main reception on Trinok 2. The reception was in the main city, the organisational hub on the largest continent. The two officers had the distinction of being classified as honoured guests due to Starfleet intelligence clearance for them to acquire a vessel of their choice. "Welcome to Trinok." The Ambassador said, stepping forwards with an outstretched hand to greet them. "Thanks!" The Captain cast an impressed glance to his first officer as a childish grin began to take form on his lips. "I’m John Graves." "I’m Ambassador Tark Vinno." The tall man offered. He was generously proportioned with a massive jolly white beard flowing from his ruddy cheeks and was clothed in a flowing red gown embossed with golden Federation insignias. "We don’t get many visitors of your calibre here." "We’re in a class of our own!" Commander Morrow agreed with sarcastic self debasement. "Normally we roll out the red carpet for merchant agents looking for whole fleets." The Ambassador nodded. "This is the first time Starfleet has sent a special dispensation order for a one off custom vessel to be prepared." "How long will it take?" Morrow asked, still focused on the matter at hand while the Captains attention had wandered and his gaze was shifting already towards signs pointing to a lounge bar. "Once you’ve made your decision it won’t take more than a few days." The Ambassador assured him. "We have a team ready with the special equipment we anticipate you’ll need and a number of ships ready to accept it." "Excellent." Commander Morrow enthused, handing the man a Padd with his files on it. "I’ve chosen a list of six classes of ship that I think will serve us well." "I can arrange an inspection of all six straight away." Vinno agreed, obviously intrigued and excited to briefly step into a world slightly larger than his own. "I’ve already personally taken charge of the entire business so anything you need I can get for you." "Anything we need?" Captain Graves grinned. "I have some ideas about that myself…"
"These six?" Ambassador Vinno scowled at the list. "They’re quite out of date but I suppose you know what you’re looking for." "Basically we’re working as a support vessel for a prototype ship." Captain Graves explained, blurting out the words thoughtlessly and earning a cutting glare from his first officer. "We’re open to suggestions!" Commander Morrow shrugged before nudging the Captains arm hard enough to serve as a warning. "Obviously we can’t say any more than that." "Of course!" Vinno smiled, glancing up from the list. "Perhaps I can show you some of my ideas for a few hours before a lunch I’ve arranged." "Lunch sounds good!" Graves nodded happily. Blake typed his access code into the Padd while the intricate internal circuitry scanned his eye for identity. He leant back in the chair and read the message as it unfolded before him. He grumbled to himself, his brow furrowing slightly as the contents sunk in and then his expression fell as he read to the end. He hung his head slightly and closed his eyes for a moment, marshalling his thoughts and burying his feelings. He stepped onto the bridge with a head full of half-churned ideas and a slightly strained expression. "We have a job." Blake shrugged. "Reader has asked us to check something out." "Who are we risking our life for this time?" Dr. Jones shuddered slightly at the ominous suggestion of taking out the Corinthian before she’d fully regenerated and repaired herself from the last time when an unknown vessel had given her a nasty beating. "Nothing special." Blake shrugged a half-hearted reply. "There’s a scientist who moved to Trinok years ago, Reader says he had Section 31 connections." "What did he used to do?" Haldo looked up in sudden interest. "He was a weapon guidance engineer, he designed torpedo computer control systems." Blake explained. "Apparently he invented the Quantum torpedo processor for Section 31 a decade ago and they smuggled the design into mainstream Starfleet to help oppose the Borg." "That was a long time ago." Haldo’s brow furrowed curiously. "What’s the interest in him now?" "I don’t know that there is one." Blake told him. "We’re just meant to check him out, nobody’s heard from him in a few years so Reader thought we could check it out while we’re here." "Are you alright?" Haldo asked, sensing that there was more going on that Blake had admitted. "I’m fine." He said with a dismissive wave of the hand. "I’m beaming down." "I’ll come with you!" Haldo suggested. "That’s not necessary." Blake shrugged. "I’m sure I can handle it." "I could do with the break." Haldo persisted. "I’ve been stuck on the flying meccano set for weeks! It would be nice to put my foot on something that doesn’t rattle." Captain Graves lowered himself gingerly into the command seat at the centre of the bridge of the new Pinnacle class freighter. The bridge was spacious and light, white plated walls with tasteful beige padding and clear black control panels dotted around with neat menus that allowed simple control of the entire vessel. The bridge light glowed with a soft blue tinge from the UV filters designed to add a healthy simulated effect of planetary daylight. The seat was soft and comfortable, a leathery effect with a ribbed set of cushions that effortlessly moulded to his body beneath the plastic covers that kept it spotless while the engineering team scurried about. "What do you think?" Ambassador Tark Vinno asked with a proud smile as he gestured around the control room. "Very impressive!" Commander Morrow said with obvious relish as he brought up the details from the main system panel. "Warp 9.5 maximum." The Ambassador told them, rolling off his well rehearsed sales spiel. "She has twin redundant warp cores feeding the warp platform and the impulse reactor, she has a defensive shield grid that’s as powerful as any Starfleet scout ship and can be retrofitted with a weapons system that can take on a Klingon Bird of Prey." Captain Graves turned slowly to face him, a wide grin carving across his lips. "I like it." "I’m glad." The Vinno smiled broadly. "This is one of the finest ships we build, there are only three completed so far and there won’t be many more." "Why not?" Commander Morrow asked with sudden suspicious interest. "The expense." The Ambassador admitted. "We’ve only sold a few of these as high end luxury transports so far. We design a ship like this every few years, it adds a touch of prestige to our entire facility and is a useful way to test new innovations but we don’t seriously market them." "Limited edition." Graves mumbled stupidly, lost in his obscure fantasies. "I think we’ve made our decision…" Commander Morrow agreed. "I don’t think we could ask for a better ship." "Thank you. 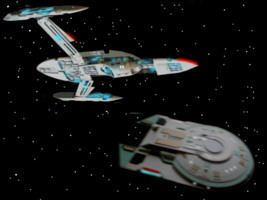 It would be an honour for one of these vessels to be handed to Starfleet for special missions." Vinno smiled proudly. "It just remains to organise the added equipment you require." "Phaser banks!" Captain Graves announced. "Type 8 if you’ve got them." "Type 8?" Morrow spun around in surprise. "From the Excelsior class?" Ambassador Vinno added in slight shock. "What are you expecting to fire at?" "You never can tell, we don’t make friends easily…" Morrow suggested to avoid Captain Graves answering. "I’d also like to upgrade the replicators, we’re going to need to be able to generate spare parts." "They’re already engineering grade." Vinno told him, grabbing a Padd from his robes to add notes. "Isn’t it lunch time yet?" Graves sighed. Blake and Haldo had replicated civilian clothes for themselves that helped them to walk unnoticed through the streets as they headed for the last known whereabouts of Professor Thompson. Trinok was a luxuriant colony, wealthy and affluent. Very much like Earth in many ways, clear blue skies and a sense of peaceful security that pervaded the inhabitants. Much of the cities were designed to offer a high degree of hospitality to visiting buyers and encourage them out of their wealth. Although money was a forgotten concept the transfer of resources was still a large part of life throughout Federation space. "Nice place." Haldo commented as they walked briskly to the address. "I guess." Blake agreed without enthusiasm. "Something on your mind, Captain?" Compz asked with a shrug. "You’ve been a little distracted." "I’m fine." Blake assured him. "We’re here I think…"
Haldo took the Padd he’d been handed and looked over to the doorway with a nod of agreement. "This looks like the place." The apartment was slightly separate from the rest of the small building that were dotted around the street, each surrounded with an efficient and tidy garden. "Come on then." Blake headed to the door and pressed firmly on the button that requested attention. They waited in silence for a few seconds. Haldo looked the Captain over, wondering what was on his mind. He hadn’t known him long but felt that he understood him well enough to know when something was troubling him. Suddenly a low hum from behind them made the pair turn to see a shimmering blue light as two men beamed in. "Can I help you gentlemen?" The first of the two stepped forward and although using polite language the tone was clearly combative. "Who are you?" Blake asked, stepping forwards to them with a growing frown. "Internal security." The man replied, flashing a clear metal ID card that projected a hologram of his image and credentials. "What’s the problem?" Haldo called out. "I’d like to know who you are and what your interest here is!" The security agent replied forcefully. "Starfleet intelligence." Blake replied. "Now you tell me what’s going on." "What is Starfleet’s interest in this matter?" Security chief Thackery sat back in a plush chair behind his unnecessarily large and ostentatious desk. He was a large man with the gait of a body builder who had begun to let himself go in recent years with a little too much easy living. His eyes were alert and flashed over the faces of the two men suspiciously. "Just tell us what happened." Blake told him flatly. "Maybe we could share information on this matter?" The Chief suggested, leaning forwards and knotting his hands together in front of his face. "Maybe you’d like to be working on a traffic docking pylon for the rest of your career?" Haldo replied dryly with a slight grin as he began to really enjoy himself. "What?" The Chief started suddenly, recoiling in surprise. "Not co-operating with a Starfleet intelligence investigation?" Blake shook his head dolefully as if in great disappointment. "Perhaps we could speak with the next chief of security now?" "I’m happy to co-operate." He smiled awkwardly as sweat began to prickle at his brow. "Maybe we just got it wrong then?" Haldo asked, raising his eyebrows and smiling openly. "So what did happen?" "Of course!" The chief laughed in relief. "Here’s my report." He handed Blake a Padd with the investigations noted on it. "I’m afraid it was a very simple case." He began as Blake read the files. "Someone broke into the man’s house and shot him with a Phaser." "A burglary?" Haldo asked in surprise. "I’m afraid so." The Chief nodded. "The assailant was an off-worlder who settled here two years ago. His access visa was perfectly in order but we’ve since found out he had something of a chequered past." "I see!" Blake grumbled. "This happened yesterday?" "We captured the killer as it happened." The chief agreed. "Nobody else was involved." "I’d like to run my own investigation." Blake told him flatly. "It’s nothing personal, I just need to double check your findings." "I’ll arrange to get any assistance you require." 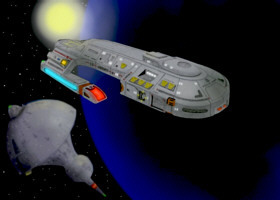 Blake stepped onto the bridge of the Corinthian with a sigh as Goruss Clogg and Ensign Rogers stepped up to join him. "My office." He told them both, barely stopping to face them as he headed unperturbed to his ready-room. "Is everything alright?" Katherine called out as she hurried to follow him. "Fine!" He told her grumpily. The door slid open as he approached and closed behind the three as Doctor Jones watched in silence. "Sit down." He told them, aiming the comment at his new chief of security. "Before we continue I’d like to have a quick chat with you." "I have some things I’d like to say as well." Goruss told him, his yellow eyes peering out from his smooth red shell-like face. "Please…" Blake gestured for him to continue. "I would like to thank you for arranging this posting for me." Goruss Began. "I worked loyally on the Violator for years but my principal loyalty is to Starfleet." "Same here!" Blake told him. "We’re not subject to normal rules on this ship but we work for Starfleet and we adhere to the principals of the prime directive." "Glad to hear it." Clogg nodded. "This is not a normal ship." Blake began with a sigh. "We don’t have much contact with Starfleet command in case of Section 31 interference. We are generally autonomous in our missions and the command structure here is a little different too." "I’m sure I’ll adapt." Clogg told him. Blake nudged a Padd across the desk towards the new officer. "Here are the tactical systems review for today, you’ll need to familiarise yourself." "For today?" Clogg asked. "Are we upgrading the systems?" "The systems change every few hours!" Blake explained. "The ship is almost totally unlike anything else in the Federation." "I see…" Clogg pulled an unreadable expression and glanced over at Katherine who smiled back awkwardly. "We also have a job to do!" Blake added. "We have a slight situation on the surface and we’re going to conduct our own investigation." "What’s going on?" Katherine asked. "There’s a scientist on the planet who we believe did some work for Section 31 some years back." Blake began. "He was murdered yesterday." "I see." Clogg grinned almost imperceptibly behind his mouth tentacle, relishing the prospect of getting back to work after his long debriefing aboard the USS Olympus. "I’d like you to examine the body." He told her as he turned to face his only medical officer. Another huge silver dish arrived at the table piled high with freshly replicated dishes of exotic food surrounding a bottle of even more exotic booze. "You certainly know how to unwind." The Ambassador commented dryly as Captain Graves pushed the food aside to grab the bottle with undue exuberance. "You must have been in space a long time." "Weeks!" Graves mumbled through a half chewed mouthful of something green. "You have no idea what we’ve been through!" Commander Morrow began, losing a degree of subtlety while under the influence of several shots of strong liquor. "I can only imagine!" He agreed with an interested expression. "I doubt that!" Graves grinned widely. "The last few weeks have been the most insane I’ve ever heard of!" "You must have interesting lives." The Ambassador told them with a knowing smile. "Sometimes things can get a little dull on this planet." "Sometimes I’d trade it all for dull." Winston grumbled, waving around a fork. "If we’re not floating through a nebula gazing out through a half built wall then I’m worrying about the floor collapsing or getting shot at trying to rescue aliens from the other side of the galaxy." "I can only imagine." Vinno said again, shaking his heard and smirking to himself. "Perhaps I’m safer where I am." "The food’s better!" Captain Graves told him with a happy nod. "This is the best I’ve tasted in months." "We aim to please!" The Ambassador said happily. "My team is working on the ship. The upgrades are coming along nicely." "I’ve gone over the specifications." Morrow replied, snapping back to business. "It’s a tough little ship." "The technology isn’t Starfleet." Tark Vinno began. "Some of the equipment you’re probably used to is either classified or restricted. Commercial technology tends to be a few years behind the cutting edge military designs. I’ve even had to pull some strings to arrange the phaser banks and torpedo tubes." Katherine sighed as she gazed at the body of the scientist. He was an older man, silver grey hair licked around his temples and his chin was lightly dusted with white stubble. His body was exposed on the metal slab and he was out of shape from too many years of easy living and not enough exercise. The sight of a corpse always seemed to trouble her. An inert mass of lifeless cells instead of a vibrant Human being. The spark doused and the dead eyes gazing forwards into nothingness as if the remains could finally see beyond life to whatever may lie the other side. Her trained eyes fixed on the chest to where a gaping wound had been carved into the mans chest, cauterised by the heat of the phaser beam. The charred flesh tattered around the opening and was blackened from the heat implying that the weapon was either poorly made or badly adjusted. "Not a professional job." Goruss commented as he scanned through the report, his eyes glancing over the body. "I doubt Section 31 were involved." "The autopsy wasn’t very thorough." She replied solemnly. "I’ll have to repeat the job." "They’ve done nothing more than a cursory exam." Clogg shrugged. "They assumed it was just a bungled burglary and may well be right." "I’ll see what I can find." She shuddered slightly as she brought out her tricorder to begin the job. "I guess I’ll go and interview the suspect." Clogg nodded in agreement. "Keep me posted on what you find." "You’ll be the first to know." She assured him. She had entered Starfleet medical to save lives and improve the lot of living beings. The thought of rummaging around inside the decaying remains of an old man was not one she relished. "Enjoy…" Goruss told her as he left, noticing her reluctance. Blake Girling looked up as the door chimed signalling that someone wanted to join him. "Enter." He sighed, marshalling his thoughts and turning off his desk mounted interface. The door opened with a lazy hiss as Haldo stepped in to join him. "Is there a problem?" Blake shrugged, noticing the sombre expression before him. "Actually yes…" Haldo admitted as he stepped forward and gestured towards a chair. Blake nodded his agreement and Haldo sat down opposite. "We have a problem with a crewmember." Haldo told him, leaning forward to rest his chin on his hands. "Trouble with your engineering team?" Blake asked, leaning back and waiting for more bad news. "Actually it’s you!" Haldo grinned slightly, a more reserved version of his normal exuberance. "Me?" Blake asked in surprise, laying his hand on his chest and starting forwards. "You’ve been snapping at people, moaning, grumpy and miserable." Haldo began. "Even more so than usual." "That’s personal!" Blake told him firmly. "Maybe I can help…" He suggested. "You’ve got to talk to someone." "I don’t feel like talking." Blake sat back, his arms folded defensively over his chest. "I brought this…" Haldo grinned as widely as ever as he slammed a bottle on the desk. It was a large, dusty old bottle from Earth full of a rare blend of whiskey that had once been the cheap crap bought in low priced supermarkets but was now considered a classic with the passing of time. "I’m not drinking that!" Blake said equally firmly but his arms began to slightly uncoil from over his chest. "It’s good for you." Haldo assured him, grabbing the bottle from the polished black ceramic table with his huge hand. "It’s a mild form of poison." Blake corrected him. "What’s good for you often is." Haldo raised an eyebrow thoughtfully as he screwed off the cap. "Letting your guard down is good for you and it’s about time you did it." "I don’t drink!" Blake shook his head, his attention fixed on the bottle. "I’ve been saving this for a special occasion." Haldo ignored his half hearted refusal and began to pour it out into a pair of small glasses. "You’ve been locked away on your own in here way too long." "I guess I’m honoured." Blake grumbled as he glared at the glass of liquor as if it was challenging him somehow. "Your Borgesque implants will probably process the alcohol in seconds anyway." Haldo smiled as he shot the contents of his glass into his mouth. "On the other hand my genetic improvements made me highly susceptible to chemical intoxication." "You get drunk easily?" Blake asked. He sipped at the hot bitter liquid and winced slightly at the sharp flavour as the fluid caressed its way down his throat. "Not really." Haldo grinned. "It has a rather unique effect on my digestion. Lets just say that you don’t want to be sleeping in the same cabin as me tonight…"
"I see." Blake frowned as he realised that Haldo had probably made that up to distract and encourage him to ignore his own better judgement. "So what’s up then?" Haldo sat back in one of the few comfortable chairs on the entire ship. "Personal." Blake told him firmly, waiting for any effect to kick in. "I just had some bad news." Blake looked up as Haldo poured another drink. He sighed to himself and shrugged slightly. "I had a life ten years ago before I died." Blake explained with a sigh of resignation. "I realise that." Haldo agreed. "I was engaged." Blake told him flatly as he accepted a second glass. "We didn’t even see that much of each other and I guess it wouldn’t have lasted anyway." "I know what that can be like." Haldo commented as he shot back his second glass with exuberant relish and began pouring a third. "She’s dead." Blake said sadly. "She was serving aboard a peace keeping patrol ship and was attacked by pirates two weeks ago." "I see." Haldo nodded as all the parts fell into place. "She was actually married to the Captain of the ship she was serving on." Blake continued. "She’d moved on and I can hardly blame her for that, I was dead a long time and she wouldn’t have had any way to know I was back." "Ten years is a long time." Haldo commented as he swung the glass in front of his eyes. "Not to me, it’s like it was yesterday." Blake told him, shooting back another glass and noticing vaguely a sort of light headedness coming over him. "I’m doing my best to deal with this ship and Section 31 and Borg implants but I’m still a human being underneath it all." "Me too." Haldo shrugged as his voice began to slur slightly. "I can live with what’s happened to me but to be honest it still hurts. I feel alone most of the time." "My stomach hurts all the time and I have this numb pain at the back of my neck." Blake told him, taking another glass as he began to lose count. "Katherine can’t do anything about it because she can’t even scan me with a tricorder." "I wouldn’t trade my accelerated intelligence for anything." Haldo began, forcing another glass of whiskey down his throat as he paused for breath. "Sometimes I get these incredible headaches from having to be aboard a ship with normal lighting. My eyes are way too sensitive, I’ve tried everything from dark glasses to optical inhibitor drugs." "Maybe it’s just this that’s causing the problem…" Blake picked up another full glass as Haldo topped it up for him. "You hardly alone now…" Blake grinned. "Not aboard this ship of misfits, you fit right in." "I’ve always had good friends." Haldo admitted, ruffling his brow thoughtfully as things came to him only with a slight effort. "The crew of the Wanderer have been very good to me, I was lucky to find them." "But not much romance in your life?" Blake asked knowingly. "Not a lot…" Haldo sighed as he fingered his empty glass absently. "It’s a cosmopolitan galaxy." Blake told him. "Inter-racial relationships are the norm rather than the exception these days." "I know…" Haldo agreed without resolve. Blake reached out and took the half drained bottle and filled both of their glasses. He held his glass up before his face and smiled to himself. Haldo snapped round suddenly as the replicator arch hummed to life and another bottle of scotch appeared in a shimmering haze of blue light. "Looks like it’s going to be a long night…" Blake told him dryly. Goruss Clogg sat opposite the suspect across a very bland metallic table in an even more bland metal cube very similar to where the man would be spending his foreseeable future. The man was swarthy with a mop of untidy black hair that framed his gaunt face. His eyes were facing downwards to the table where his hands were resting, connected by a crude metallic shackle that was clearly not designed for his comfort. "So you like it here?" Clogg asked with a grin that was hidden behind his mass of small mouth tentacles. "Not especially…" He grumbled his reply. "Well you’re not doing anything to help yourself to get out." Clogg told him, leaning forwards somewhat aggressively. "I can’t tell you anything." The young man grumbled, backing away sheepishly and pulling his hands up to his chest. "What were you on?" Clogg asked, relaxing slightly. "Drugs, alcohol, electro-stims?" "All of that." He shrugged. "I can’t remember anything until I woke up here." Goruss stared hard as the mans eyes turned upwards. His eyes were steely grey and had an emptiness that had grown behind the barriers his life had erected around him. "Have you any idea how much trouble you’re in?" Clogg asked with a shrug. "I have an idea." He mumbled his reply. "You couldn’t have picked a worse man to kill." Clogg told him. "He was the man who more-or-less invented the quantum torpedo." "I don’t know what that is." He replied softly. "It’s a few extra decades on your sentence." Clogg smiled. "If you live long enough to enjoy it in the state you’re in." "I’ve been locked up before in worse places than this." He said flatly, his eyes still averted to the floor. "Who said you’d be locked up here?" Goruss asked with an exuberant gesture of his arms. The two men sat in silence for a few seconds while Clogg let the idea sink in. "Trent Markus…" Clogg began. "You’ve done time for a few dozen petty crimes in medium security correctional facilities since you were able to walk." "So murder of a high ranking Federation scientist is a whole different game." Clogg sneered. "I don’t remember anything." Trent told him. "What’s the last thing you do remember?" Clogg asked hopefully. "I was out." The young man ruffled his brow thoughtfully. "Just having a drink." "Who did you meet?" Clogg pressed on through the crack in his defences. "I was alone." He insisted. "How were you paying for your drinks?" Clogg asked. "I’ve been working." He told him flatly. Goruss sighed and leant back in his chair as he reviewed the data on the Padd. There seemed little doubt that the case was as simple as it appeared but something still troubled him slightly, somewhere at the back of his mind was a nagging doubt that something was wrong. "How did you break your finger?" Clogg asked, noticing from the file that Markus had fractured his right index finger and had received medical attention from the prison staff. "I don’t know." He muttered moodily. At the side of the small Captain’s ready-room was a small, three seated sofa. It now contained the somewhat debilitated form of Haldo Compz ungainly and somewhat skeletal frame over which his ill-fitting uniform was haphazardly stretched. "It’s not easy being different." He slurred, waving the replicated bottle and sloshing the remains around inside as he did so. "Tell me about it…" Blake mumbled from his chair, dragging his head up from his arms where it had been resting for a moment. "At least you still look normal!" Haldo told him grumpily. "I’m a big gangly thing with funny skin and bad breath." "I wasn’t going to mention the breath." Blake grinned uneasily as the room seemed to revolve around him while staying still. "Anyway, all my hair fell out and I lost two stones in weight!" "But your implants are just adapting you towards your physical ideal." Haldo stammered slightly as he stumbled over his own words. "You’re just evolving away from your inner monkey." "Supposedly." Blake shrugged as the he wrestled with the word. "I wish I had shields and could fire phasers out of my hands!" Haldo sighed. "Apparently I have a built in replicator too." Blake smiled awkwardly. "Doctor Jones says it’s powered by chemical energy from my body but he doesn’t know if it will work." "A replicator?" Haldo giggled unreservedly, suddenly finding the whole thing ridiculous. "What?" Blake grumbled. "What’s so funny?" "What else have you got in there?" Haldo laughed, his voice shrill and thin as his integrity was now utterly overwhelmed. "Maybe we could put you in the circus!" "Thanks." Blake slurred. "I’ll bear it in mind if a need a change of career." Ensign Katherine Rogers wiped her hands on a rough towel that hung on a narrow metal beam that ran along the length of the body slab. She sighed and turned to her amphibious colleague. "I’ve got nothing to add." She told him with a note of relief that rummaging around inside his chest cavity was finally over. "He was killed with the phaser pistol that the suspect was found with, the angles correspond precisely with the police reports." "So just some bad luck?" Goruss suggested. "It does seem that way." She agreed. "Did you read the notes about Markus?" He asked, turning his gaze from the corpse that held his attention in a not entirely healthy way. "I scanned through them." She replied without interest. "That’s more your department." "He had a broken finger." Clogg explained. "So?" She asked, not sure what he was implying. "His trigger finger." Clogg explained. "He was using an old type D civilian defence weapon. The trigger button is a small round metal switch." "He was a user of a lot of dangerous and illegal narcotics." Katherine offered by way of an explanation. "They can cause physical degradation as well as a numbness to pain." "If his finger was broken he’d have been likely to be carrying the pistol in the opposite hand." Clogg began. "I think he broke his finger by firing the weapon." "It’s hard to believe." Katherine frowned. "According to the report he was a burglar who was surprised, he fired in self defence." Goruss Clogg glanced down at his Padd and then back up to the corpse on the metal table. "Crime simply doesn’t happen on a leading Federation colony." He explained. "And now it coincidentally happens to the man we’re investigating." "Coincidence?" Katherine cocked her head to one side and discarded the towel before leaning back on a diagnostic computer console. "Doesn’t seem entirely likely, does it?" Captain John Graves stared aimlessly around the large and incredibly well appointed lounge of the hotel suite that had been arranged for him. "They’ve nearly finished!" Winston Morrow enthused. "They’ve mounted the weapons platforms and boosted the defensive shields to the maximum level the power plant can cope with." "Quite a ship!" Graves nodded. "It will certainly beat the Wanderer." The Commander grinned. "No more falling through the deck plates, no more eating replicated food that tastes like you’re licking the grease off a plasma manifold, no more dropping out of warp to recover bits we lost on the way…"
"Won’t you miss her?" The Captain sighed slightly sadly. "She had her good points too." "I won’t…" He shrugged earnestly. "I admit she gave her all but she gave it ten years before we got her and didn’t have much left for us!" "She was my first ship." Graves explained. "I worked and fought my way hard for twenty years to get her so we could continue our work on bringing down Section 31." "You commanded the US Ceylon before that!" Morrow frowned. "But I didn’t own her, I was just assigned to her by the Federation Trade commission." The Captain replied with a shrug. "The Wanderer was mine, it was all of ours." "I never realised you felt so strongly." Morrow said with a sympathetic tone. "It was the first time I felt like myself." He explained. "Well now you have a fantastic new ship." Morrow told him. "This one is twice as fast, three times more powerful, four times better equipped and five times better armed!" "But will it be as much fun?" Graves sighed wistfully. "When was it fun?" The Commander wondered out loud. Goruss Clogg stood before Mr. Thackery, the local police chief. "What species are you then?" The large man asked in a slightly accusing tone that reflected that fact that dealing with more exotic races was something that he infrequently did. "No offence." "None taken!" Clogg told him without taking his equally accusing glare from the mans eyes. "Have you got what I asked for yet?" "The information is being compiled now." Thackery sighed, making it clear he thought the effort was superfluous but falling well short of saying so to a Starfleet intelligence operative. "I hope you get everything I need." Clogg told him, offering no room for any doubt that he intended to leave no stone unturned. "I need records of every communication that the suspect logged this year, a full list of every visitor he’s had, a full list of everyone he works with and full access to the security database." "As I say…" The burly man leant forwards over his desk. "We’re compiling it." "I knew I could count on you." Goruss Clogg sneered his reply. "How much longer will it take?" Katherine materialised in the Transporter room aboard the cloaked Corinthian. She glanced around to see Doctor Jones operating the control system that was set into the wall of the cramped compartment. "I didn’t expect to wind up here." She smiled uneasily. "I normally get beamed directly to the bridge." "I don’t know what’s going on." He shrugged. "Captain Girling and engineer Compz have been in the ready room for hours, things seem to be running on manual all over the ship. We’ve had to cancel shore leave for two of the crewmen to keep things running." "You haven’t heard from the Captain at all?" She frowned to herself, wondering what could be wrong. "Mr. Compz told us to stay away for a while." The Doctor told her. "I doubt anything’s wrong, I think they’re just discussing the repairs." "I’m due to check in." She shrugged. "I’ll go and see them to give my preliminary report and make sure they’re ok."
Goruss Clogg gently laid his black box on a table and it opened by itself, folding out to offer him the equipment within. "Lights." He said, they instantly responded around Professor Thompson’s house as the computer tracked his position and illuminated the rooms as he moved around. He breathed in, just waiting to get the feel of the surroundings. The man had simple taste, the decoration was sparse and sensible with trophies and souvenirs packed into cases around the walls, memories given form for an old man losing touch with the present. "Computer!" He spoke with a softly respectful tone. "Interface with Thompson’s private logs." "Accessing." Came the electronic reply. There was an outline on the floor of where the man had finally fallen on a tasteful and simple blue/grey carpet leaving no blood stain from his instantly fatal and cauterised wound. "Access established." The computer informed him efficiently. He turned his attention from the crime scene back to his portable terminal as the mans private records opened up before him like a voice beyond his time. Clogg noticed a file heading that interested him. "Open current projects file." He told the computer and the file duly accessed and opened. "Long range weapon control tracking system…" He mumbled thoughtfully. "Open file." "The file has been deleted." The computer told him. He rubbed his chin in silent contemplation. Blake rubbed his forehead and shook off some of the cloudiness that had fogged his mind. The second bottle was a distant memory and a third had been half drained by the pair as they continued to work their way inexorably towards oblivion. "Because…" Haldo began lazily, his words seeming to trip over his rubbery lips. "The thing about this ship is that it’s too conflicted." "I know." Blake agreed with an overt gesture of his head as he shuffled around in his seat. "I think that it’s connected directly to my unconscious mind, all the dark stuff I keep buried feeds straight into the computer." "I get it." Haldo sat up suddenly as if he’d been exposed to a great revelation, bracing himself with his arm as his body came close to slipping off the seat. "You told me that!" Blake reminded him with a stupid grin carving across his face. "Sometimes I forget how clever I am." Haldo said with a straight face before dissolving in a fit of childish laughter. "What do you think about the Borg?" Blake asked as if he’d been contemplating the thought for hours. "We didn’t encounter too many on the D-13 shipping lanes." Haldo chuckled to himself. "From what I’ve read I’m glad I didn’t." "Did you ever get into a fight?" Blake grinned ridiculously. "Yes…" Haldo admitted proudly. "But we never won! The Wanderer had lost every fight it was ever in, usually before the fight even started." "The eternal under-dog!" Blake agreed, hoisting up the bottle and removing the lid ready to continue. "Well we kicked Section 31s collective arse!" Haldo added triumphantly. "We haven’t done so well since." Blake frowned. "We’ve had a run of bad luck." Haldo waved his hand dismissively. "Maybe this ship is cursed…" Blake grinned. "Nothing would surprise me." Haldo agreed with a nod that over balanced him enough to fall from the sofa and roll onto the bare metal floor where he lay giggling quietly to himself. Suddenly the door chime sounded through the ready room. Blake sat up suddenly and glanced around. Haldo was hidden from his sight but he could hear the muted sounds of his laughter. He pulled his uniform tunic straight and ran his finger around the neck of the jumper to check his four gold pips. "Enter…" He called out reflexively as the door hissed open. Ensign Katherine Rogers stepped into the room as the door slid shut behind her. "Oh…my…god…." She gasped, her eyes flicking around everywhere. She looked down to Haldo’s crumpled form where he had now found himself absolutely hilarious and had begun rolling around the floor clutching his ribs as he laughed uncontrollably. "Hello." Blake waved a greeting. "How are you?" "Are you drunk?" She gasped, her eyes narrowing and an uneasy smile beginning to form on her lips. Blake held up his hand and held his thumb and fore-finger a few millimetres apart. "Perhaps a little…"
"I guess I don’t need to ask about him?" She pointed at Haldo who was still lost in his amusement of nothing in particular. "Probably best not to…" Blake nodded solemnly. "I was going to deliver my report." She told him disapprovingly. "Can it wait?" Blake slurred. "He’ll still be dead in the morning, won’t he?" "I guess it will have to." She nodded. "I’ll take the bridge watch for now, shall I?" "Don’t take it far…" Haldo called out, bursting into fits of laughter at his own comments. "We’re still using it…"
Katherine chose not to reply, she turned and left the room, resolved not to mention the incident to the crew. "She likes you, you know?" Haldo hoisted himself up from the floor. "Katherine Ensign." He slurred a reply as he shuffled back to the chair. "Rogers?" Blake asked as if the suggestion was ridiculous. "Maybe you’ll get a chance to try out your Borg probing device…" Haldo grinned. "You disgust me!" Blake frowned, pointing an accusing finger at his friend. "Blake…" Haldo began proudly. "Sometimes I disgust myself." Goruss Clogg sat in a quiet room in the security hall that had been Thackery’s private office until he decided that chucking him out of it would be most deserved and amusing. He scanned through the data on the Padd. On the desk was a small black case full of equipment that he’d replicated to help him. He stood up and placed his hands on his head as he began pacing thoughtfully. "Computer…" He began. "How many people have contacted the suspect in the last three months?" "29 people have contacted Trent Markus in the last three months." The computer replied curtly in a polite female voice. "Delete all names that have been identified as his friends and have been dropped from enquiries." He told the small portable interface device. "13 People have contacted Trent Markus in the last three months." The computer replied to his instructions. "Now delete colleagues." He ordered. "No people have contacted Trent Markus in the last three months." The computer told him. Clogg began pacing the small room, waiting for inspiration to strike him. "How many people have accessed the suspect’s files in the last 6 months before the murder?" He said suddenly as an idea took hold. "Trent Markus’s records have been accessed twice." Came the automated reply. "Show details." He smiled broadly. Ambassador Vinno stepped proudly onto the bridge of the new ship. Any doubts about the vessel were instantly wiped away from his mind as Captain Graves followed him out of the Turbo-lift. The lighting was perfect, pale blue-white light caressed the control panels and the smooth black control display screens and there was a distant electronic hum from the various systems warnings as diagnostics ran over the newly installed equipment. "Your people work fast." Commander Morrow commented as he gazed with a strong sense of awe around the bridge. "There was a lot of them!" Tark Vinno grinned. "And we had done most of the preparation work before you arrived." "I like it." Captain Graves said redundantly, rubbing his chin thoughtfully as he gazed around the bridge. On the approach in the small travel pod he’d got his first proper view of the upgraded transport vessel through the large windows and had been more than a little impressed. Compared to Starfleet some of the design was fairly out of date but the whole ship had an air of dignity and was a clean elegant design punctuated by the additional weapons and armour they’d arranged to have fitted. "She’s been tested to full power in space dock." The Ambassador announced casually. "She’ll be ready for a full impulse and Warp run in a couple of days once the diagnostics have been completed." "We’re planning to shake her down ourselves." Commander Morrow added conversationally. "We’re quite looking forward to ironing out the bugs." "I doubt you’ll find any." Vinno said with a pride that fell short of arrogance by a narrow margin. "If we can’t find any then we’ll make some of our own." Graves commented as a joke but somehow nobody actually laughed. "Morning…" Blake said softly as he stepped slightly uneasily into the tiny medical bay. "I imagine you feel pretty bad!" Katherine crossed her arms and began tapping her foot in annoyance. "Actually I feel much better." He smiled weakly. "But my head feels like a small piece of bulkhead has flown through it… and I’d know." "You’ve only got yourself to blame." She scolded angrily as she turned to a rack of medical hypo-sprays to prepare a pain killer for him. "I could blame Haldo." He shrugged. "In fact I think I will." She slammed a small vial into the base of the spray and offered it up. "This will help to clear your head." "How did you know?" He grinned awkwardly as he cocked his head to the side to let her inject the concoction into his neck. "Maybe we can keep this to ourselves…"
"Who would I tell?" She pressed the cold metal base to his neck a little harder than she needed to and a small hiss sounded automatically. "What did you find on Trinok?" Blake asked as he rubbed his neck to alleviate the slight numbness that followed. "Not much." She admitted. "I couldn’t find anything that didn’t exactly correspond with the security investigators assessment." "Did you keep your eye on Clogg?" He asked, the fog that had descended over his mind was finally beginning to clear. "I trust him." She leant back on the counter and returned the hypo-spray to the racking. "He knows his job, he stayed on the surface to continue." "I wonder how he’s doing?" Goruss Clogg sighed to himself heavily. His investigation was beginning to trouble him greatly, what he’d found suggested exactly what he’d feared all along. He’d drawn conclusion based on his findings and the few leads he’d managed to find and now was the time to act upon them if he was to impress his new Captain with his initiative and efficiency. He closed his small black box that contained the computer interface and the probe attachments that boosted the abilities of his tricorder and huffed out a deep breath. "Clogg to Corinthian." He said as he pressed the comm-badge. He’d been told in the briefing that he would not be likely to receive an answer from the ship, the computer would simply deal with his request as efficiently as possible. "Upload the co-ordinates on my tricorder and beam me directly there." He took out his hand phaser and set the weapon to the maximum level of stun. He stood with it at his side with his equipment hanging in his other hand as he waited for a few seconds. Suddenly his ears swam with a loud humming sound and the whole room lit up in a glimmering blue light as he began to dematerialise. Captain Graves sat gingerly down into the command chair at the heart of his new bridge while Ambassador Vinno stood behind holding the polythene wrapping that he’d just removed. The cushions yielded gently as the weight of his body settled into the seat. It was raised slightly on a circular platform that had a faint blue marker light running around its edge. Before him was the large view screen, heavily encased in sweeping architecture and showing only a white grid marking until the ship went fully active. He swivelled his head around the bridge, the flight controls were in front and to his right and he could easily see over the pilots head to the console. The science station was a large column to his left set into the wall and included the communications controls. He simply couldn’t fault the design. "There’s even a little place to rest a cup." Vinno pointed enthusiastically at a small round indent in the arm of the chair. "Impressive." Morrow grinned at his Captain mockingly. "You’ve certainly thought of everything…" Graves agreed. Suddenly a bright column of light appeared on the bridge, flickering a silvery blue and humming noisily as the form of the Corinthians chief security officer appeared. Goruss Clogg stepped forward clutching his phaser. "Ambassador Vinno?" He asked, his eyes locked onto his target like the natural predator he had evolved from and into. "Yes." He agreed with a slight trepidation. "I would like to speak with you." He continued, stepping forwards slowly and watching every movement of his quarry. "Well I’m very busy." The Ambassador scowled, edging away. "This will not wait…" He insisted firmly. "What’s this all about?" Captain Graves stood up and began a clumsy attempt to take control of the situation. Clogg ignored him and raised the weapon to level at the Ambassador. "He knows what this is about!" "I’m as much in the dark as you are!" Vinno shrugged nervously, wincing under the threatening glint of the projector orifice of the small pistol. "Why did you access Trent Markus’s records three days ago?" Clogg asked, his head lowering so he was glaring out threateningly from under his brow. "It’s my job to check records…" Vinno blustered. "It’s your job to sell transport ships." Clogg corrected. "Yet you have accessed forty personal records of known or suspected criminals before the murder took place." "So what?" Commander Morrow shrugged in his ignorance. "So he picked Markus." Clogg replied angrily. "And set him up as a murderer." "No!" The Ambassador cried out. "It wasn’t me. I just used my clearance to access the files." "Then who?" Cloggs voice lowered to a threatening rasp. "He was a special operative." Vinno stammered. "I’ve worked for him before." "He told me that Starfleet intelligence were sending someone here to retrieve a scientist." The Ambassador closed his eyes in fear as beads of sweat ran freely down his forehead. "He had to get him first. I didn’t know he was going to kill him." "I need more." Clogg told him. "I need it now." "He knew that the Professor was working on something to do with telepathic control." The Ambassador edged back towards the rear bulkhead away from the weapon. "He had to stop you from getting it." "He’s a Vulcan." Vinno cried out fearfully. "He’s part of Starfleet…"
"Section 31…" Commander Morrows eyes widened and he snapped round in surprise. "We’ve got to stop him!" Captain Graves called out. "Contact the Corinthian." "He’s already leaving." Vinno told him. "Then you better keep talking…" Clogg told him angrily. The blackness of space faded and began to glow softly as the cloaking shield around the Corinthian lowered revealing her gaunt unfinished and uneasy appearance. Her nacelles jutted forwards proudly, glowing a fiery red with tendrils of blue energy conduits snaking through their length. "A Starlight class light transport ship?" Blake huffed. "Shouldn’t be too hard to find." "I’ve found twenty of them!" Doctor Jones told him. "Any of them in a hurry?" Blake asked, turning from the viewer. "One’s in a real hurry. He’s in an RCS thruster only zone running at three quarters impulse power." The Doctor told them. I’ve sent the co-ordinates to the helm. "I’ve got them." Blake told him. "We’re on our way…"
The Starlight class was a small ship, a dedicated civilian vessel with a bulbous rounded nose and a small tail cargo section beneath two sweeping curved wings that held the engineering equipment. The small ship was streaking through the traffic lanes away from the planet surface and the small orbiting station. Haldo Compz switched the firing system to manual control and targeted the small vessel’s engines. "Any luck?" Blake called out. "Nothing…" Haldo replied. "I can’t access the targeting system, there’s something blocking our controls." "So we can’t lock on with a tractor beam or the Transporters?" Katherine asked. "We can’t stop that ship?" "I’m losing helm…" Blake called out in surprise. "I can’t keep the ship straight, Impulse is failing too." "We’re slowing down!" Haldo confirmed. "That ship is going to get away…"
"Oh my god!" Ambassador Vinno called out, cowering in fear at the rear of the bridge. "We’re in visual range of the Starlight ship!" Commander Morrow reported from the flight controls where he liked to be best aboard a Starship. "We have no crew." Vinno muttered in abject horror. "This ship hasn’t been tested in space yet." "We’re testing it now." Goruss Clogg growled at him. "Now shut up!" "The Corinthian is in trouble." Winston Morrow said as he ran his eyes over the display. "Her power systems are fluctuating." "Do we have weapons?" Captain Graves called out, a wide grin forming across his lips as he relished every second of what was happening. "Still nothing…" Clogg grumbled. "The conduits are still not active, the systems just aren’t ready…"
"Don’t tell me…" Morrow groaned. "You know what to do…" Graves grinned. "You have a plan?" Clogg asked optimistically. "We have a sophisticated method of dealing with emergencies." Commander Morrow told him. "RAMMING SPEED!" Graves called out enthusiastically and a faint whimper sounded from the rear of the bridge. The Corinthian stumbled along behind the escaping ship, slowing from impulse speed with every passing second. "Fire!" Blake instructed. "Minimum power, best guess." Haldo shrugged as a flaming beam of phaser energy blasted out of the nose of the ship, missing wildly and vanishing into the unseen depths of space. "Nowhere near the ship!" Blake grumbled. "You wanted to hit the ship?" Haldo asked sarcastically. "Why didn’t you say?" "There’s another ship!" Doctor Jones reported. "Coming up fast from behind." The view screen lit up with the image of a medium sized freight transporter. The ship was flat with a rounded domed upper hull leading to a recessed bridge at the top and a lower boom containing the powerful impulse engines. It streaked past them, a brightly glowing blue impulse crystal feeding the powerful engines. "Now what?" Blake dropped his head into his hands in dismay, guessing at what was happening. "Not again!" Haldo grumbled. "I’m getting nothing from targeting systems, nothing from engines now either." "We can’t just sit and watch!" Katherine cried out. "She’s right." Haldo agreed. "We don’t have any popcorn." "You’re not joking?" Clogg smirked as the Starlight ship loomed ever closer in the view screen. "I’m afraid not!" Morrow agreed. "He seems to enjoy this sort of thing." "Hailing frequencies." The Captain instructed, slamming his balled fist down on the arm of his command seat. "Open." Clogg replied as the channel clicked on. "This is Captain John Graves." He began. "Drop your shields and surrender your vessel." "He’s preparing to warp!" Clogg warned as the power readings accelerated through the ships nacelles. "Full shields." The Captain ordered. "Fire engines to maximum." The nose of the new ship pitched to starboard and ran headlong into the starboard nacelle of the small freighter. The shields clashed violently, blue arcing energy licked across the deflector grid as both ships locked together momentarily before the little ship became utterly overwhelmed by the superior power of the bigger vessel. 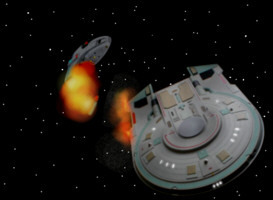 The nacelle sheared easily, rolling from the support mounts and exploding away in a blaze of bright blue plasma as the new vessel rolled away with only minor damage. "Yes!" Captain Graves cried out triumphantly. "The shields are down now!" Clogg reported softly, somewhat surprised and immensely impressed at what had happened. "I guess we can beam him off now." "Not just yet." He ordered. "Let’s let him sweat a little first!" "All power is restored." Haldo said in surprise. "Scanners are back online!" "Everything’s normal." Blake agreed. "Don’t ask me what’s happened." "I wouldn’t dare!" Haldo shrugged. "Clogg to Corinthian…" A comm signal sounded around the bridge. "Is everything alright over there?" "It is now!" Blake agreed. "We’re on our way over to deliver my report." He continued. "We’ve captured the real assassin." "I’m glad we could help!" Haldo grinned. "The real killer was a Vulcan officer assigned to Section 31." Clogg explained. "Professor Thompson was working on a long range tracking device that used the mental frequencies of telepaths to control torpedoes faster and more efficiently. The Vulcan used the device to extend his telepathic powers and was controlling Markus with a sophisticated long range mind-meld. He forced him to fire on Thompson to keep the information out of hands, without realising that we weren’t actually looking for it. He was much stronger physically than the Human and the force of the control overwhelmed him to such a degree that he broke his own finger on the trigger." "Section 31 assumed that we were there to recover the scientist and decided it was best to kill him first." Captain Graves added, rocking on his heels proudly. "The Ambassador was apparently assigned to watch us and pick out someone with a bad history to who would draw no attention from the security forces." "He was trying to use the device on you." Katherine told Blake. "It seems your Borg implants shunted the telepathic signal to the computer systems which was why the ship appeared to fail." "We have new shield schematics now that will stop anything like this in the future." Haldo told him. "I’ll go and install them whenever you’re ready." "The device was installed in his ship as it required a huge amount of processor power from the computer. The prototype was destroyed and the schematics were lost." Clogg reported. "What about your ship?" Blake turned to Captain Graves. "Well she’s not really ready yet but my crew can get her up to speed." He told him with a happy smile. "She’s shown herself to have a good heart, I think we’ll stick with her." "Fair enough." Blake smiled back. "What are you going to call her?" "What else?" Commander Morrow grinned. Haldo led crewman Lee Marks into the engineering compartment of the Corinthian to begin the shield upgrades. The force fields had been lowered temporarily to allow him access so he could carry out his work. "I prefer the new Wanderer to this thing…" Marks shuddered as he looked around nervously. "This ship is certainly more fun." Haldo commented dryly as he glanced around to check for weapons emitters that might see fit to fire on him of snaking conduits that had an unfortunate habit of throwing his tools around. "Why is it so dark in here?" Crewman Marks gingerly edged towards the throbbing blue sphere at the heart of the engine. "It is, isn’t it?" Haldo smiled to himself as he noticed the lowered lighting. "I wonder what’s wrong now…" Marks sighed, wishing he’d been assigned to the new Wanderer repair team instead. "I think that everything’s working fine." Haldo replied happily.